Personalized Multi Opener Keychains Custom Printed in Bulk or Blank. Promotional, Inexpensive. Budget Prices in the USA and Canada. Wholesale advertising Multi Opener Keychains on sale. Lowest cost in North America. We also supply blank (not custom printed) Multi Opener Keychains: see Price Table below. Free Artwork Design. American Clients pay no taxes. The unit prices below include your l color custom imprint directly on the opener. . Add $0.25 per unit for each additional imprint color. PRODUCTION TIME: 3 working days after art approval; Blank (not personalized) Multi Opener Keychains ship next day. Manage all of your office needs with this versatile multi-opener. 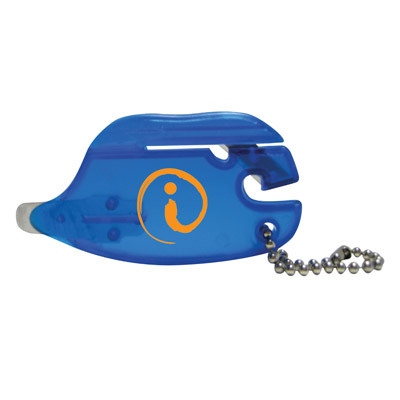 This multi-function key chain features a staple remover, letter opener and twine cutter to help manage documentation on-the-go. Measuring 1.38"h x 2.62"w, its compact size makes it easy to latch on to anything or store in even the tightest areas. Available in three different colors and direct imprinting options are offered. A great tool for teachers, offices, mail rooms, and more! Available Colors: Translucent: Black, Blue, or Frost.